At halftime in today’s match between the Philadelphia Fusion and Florida Mayhem, the Overwatch developers showed off their new map, called Petra, that will go live in the game on May 22 during the Overwatch Anniversary event. In the short gameplay trailer that we saw between Overwatch League matches, it appears that Petra is part hidden city and part science installation, with players experiencing Deathmatch gameplay inside some sunken areas with dangerous overlooks. It doesn’t all appear to be open areas to control, though, as there are a couple long corridors with some risky sightlines that seem like they’re going to reward good Hanzos and Widowmakers as much as they’re going to punish reckless Soldier 76s or Junkrats. 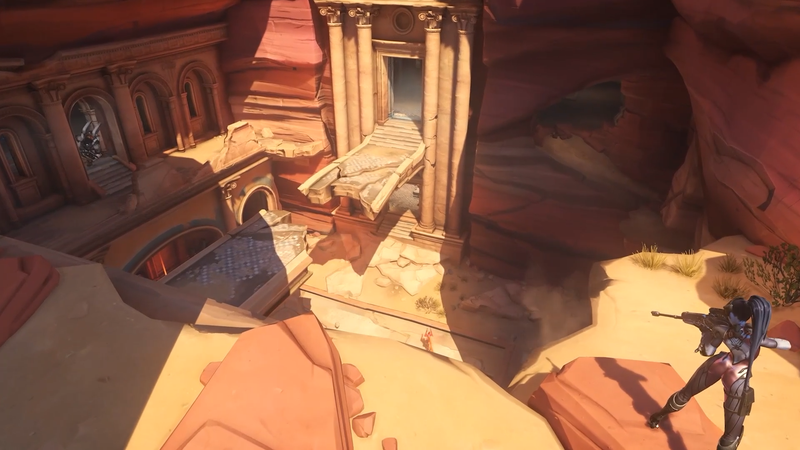 While much of the Overwatch Anniversary content seemingly leaked earlier today, including skins and a full video flythrough of Petra, this is the first official look that we’ve gotten at how the map is intended to work. The video shown at the Overwatch League event shows off the risks and rewards of playing the map much better than the raw leak video, and the joke that caps the whole thing off is a lesson for any wiley DPS player who thinks it’s a good idea to stand on top of a giant rock spire. It’s also interesting that this is a map that’s based off of a real location. Located in modern-day Jordan, Petra was the capital of the Nabataean empire around 2000 years ago. Hopefully that means that there’s going to be some kind of ancient artifact for players to fight over.